When we started homeschooling, we researched and decided upon a combination of Charlotte Mason (birth to age six-ish) and classical (after age six) methods of education. We did well for a few years and then realized we hadn’t really stepped from Charlotte Mason to classical. I switched curriculums and added some areas to our school to rectify that. One of the areas I had dropped for lack of organization was memorization. Don’t run! Memory work is easier than it sounds and is so stinkin’ good for kiddos’ brains. Seriously. Don’t believe little ol’ me that memorization is great for the brain? Well, then read a few of these sources. Today, I want to share a tool a friend (thanks, Linda!) shared with me and it changed my practice and encouraged perseverance. Both important aspects in tackling memorization work for a mama and her minions. I heard about memory cards and boxes years ago, but knew immediately that they wouldn’t work for us. There was no way “in God’s little green earth” (hat tip to Mom) that we would be able to keep the index cards in the box (aka: we would spill them just about every day, I’m sure) much less keep them in order (hahahahaha!). So… with no tool, memorization work was hit and miss. I am notorious for forgetting to follow up on it, despite have a wonderful writing and grammar curriculum that provides poetry memorization (yea, First Language Lessons and Writing with Ease). Factor in six children and it’s really laughable. Instead of a little box with loose index cards, we use a binder with clear page protectors and tabs. Easy to handle and use. Here is how to make and use the spectacular binders. Remember, the tabs are the following: O (for odd), E (for even), M, T, W, Th, F (for days of the week), and then 1-31 (for days of the month). Print out the memory work. Since we had already been memorizing some items, I printed out work that the children were currently working on as well as some I knew they had memorized fully. Place the current memory work at the front of the binder (aka: first pages). 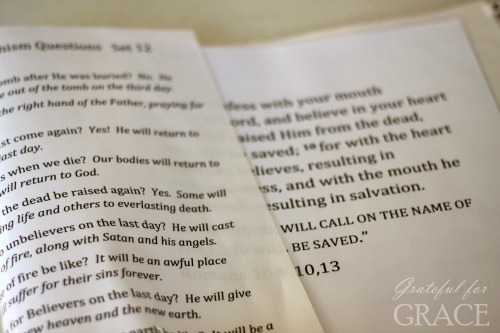 Place the print outs in page protectors (you do not have to do this part, but they are more likely to last through lots of page flipping if they have the plastic protection) and put them in front of all the tabbed pages. Place previously memorized work in blank spots. Fill in the spots behind the tabs with work already completed. Start with the odd and even, then move to days of the week, then to the numbers. You may not have enough to fill in the numbers yet (we don’t), so just leave them empty. As a child memorizes a piece, move it and bump another piece. As a child finishes a current work (can say it to you several days in a row without looking or prompts), move it to the “even” spot. Bump the “even” piece to the odd and bump the odd to an empty day of the week. Once the days of the week are full, bump a day of the week to an empty number (which corresponds to a day of the month). Every day, set a time for memorization and the child moves through the “spots”. The child first works on the “current” pieces. I have them go through these three times each (verses, poem, catechism). Next they figure out the date (which they usually have to actually seek out since they are oblivious to that information, unless their birthday is close) and do either the odd or even, then the day of the week, then the date number. Again, each piece in each spot three times aloud. So… here’s how today worked for Phoebe: She recited aloud three times each her catechism list of questions (5 Qs per page) and the Scripture (she needs a new poem, oops!) from the front of her binder (aka: current memorization work). Then, she turned to the O for “odd” tab and recited aloud the paper there. Next, she turned to the W for Wednesday and recited the paper there. Finally, she flipped to the 9 for October 9th tab and recited the work there. These work so well that I’m considering making one for myself. I think this system could help my 43 year old brain retain better. I love that the kids will each have a binder to take with them when they leave home, full of all the wonderful pieces they have memorized. Granted, HB’s may be less full since we just started this last April, but she will fill it. I”m confident. As far as choosing what to memorize, that’s up to you. We choose Scripture because it is so important for a Christian’s walk. We choose catechism because we want to be sure they learn the essential doctrines of our faith. We choose poetry because it encourages beautiful language. 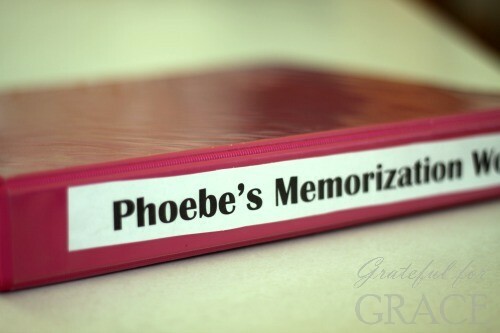 I think any family could utilize this system and see real success at memorization. How could this system work for you?